Pop into your local Maidenhead Aquatics store from 19th January 2019, to take advantage of our multi-buy promotions on SuperFish Frozen Fish Food. Choose from Mysis, Bloodworm, Tropical Quartet, Brine Shrimp and Tropical Mix each priced at £2.99. Both frozen fish food ranges are available instore only for a limited period only and whilst stocks last. Frozen fish food is a great way of providing your fish with all the vitamins, proteins and carbohydrates they need for optimum health in the very freshest form; which will not only improve your fishes' immune system and boost their energy, but will also help support healthy digestive systems and encourages a more natural feeding behaviour. 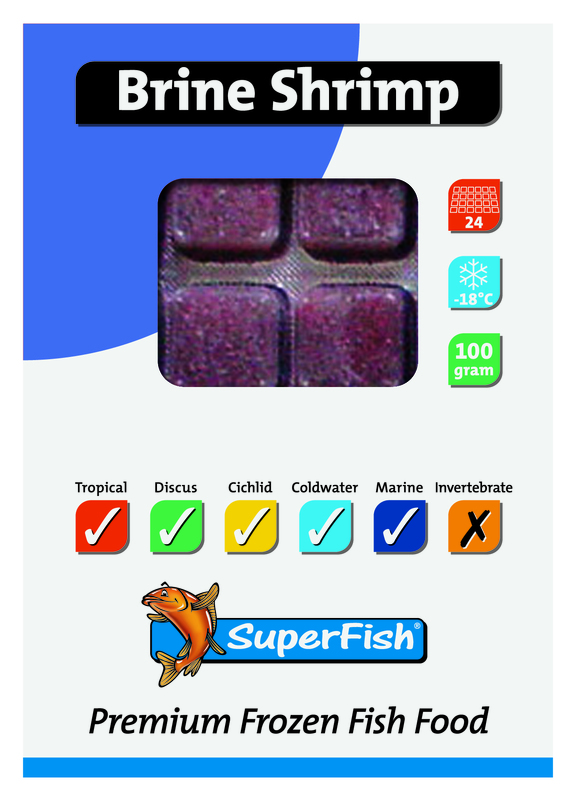 The unique cleaning and freezing process used by SuperFish means that these products provide your fish with the same quality nutrition as live food found in the wild but without the presence of harmful parasites and bacteria, prepared in pre-measured cubes, which keeps mess to a minimum as they thaw. SuperFish Frozen Mysis Shrimp is a great food for your fish and is higher in natural protein than many other foods. Frozen Mysis shrimp is a very good food that will really help fish put on weight and tempt the most finicky feeders! 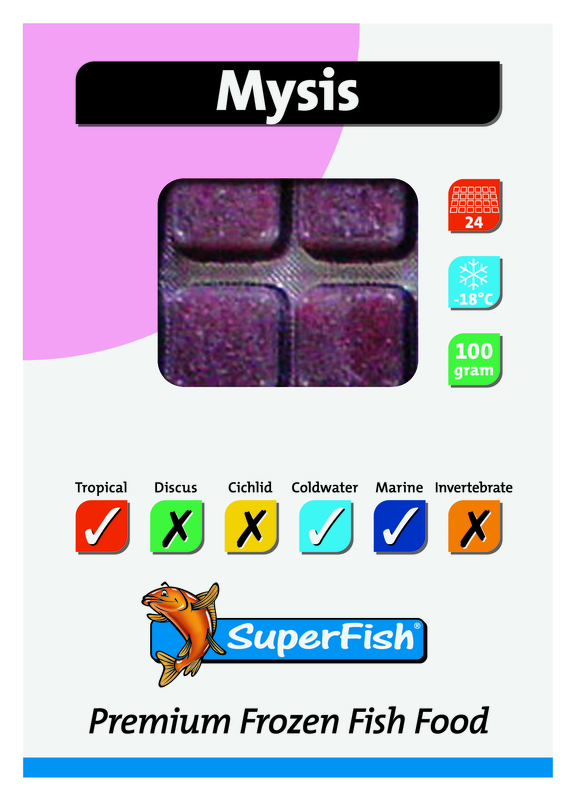 "SuperFish Frozen Tropical Quartet contains four individual rows of food (6 individual blisters of each variety), consisting of: Bloodworm, White mosquito larvae, Daphnia, Brine shrimp. The advantage of buying the SuperFish Frozen Tropical Quartet allows you to regularly vary the food given to your fish." SuperFish Frozen Brine Shrimp stimulates feeding responses in even the most finicky eaters. It is suitable for the majority of freshwater, coldwater and marine fish. Brine shrimp provides your fish with a wholesome source of high quality lipids (fatty acids), enzymes, proteins and other essential nutrients. SuperFish Frozen Bloodworm is readily accepted as a natural foodstuff by virtually all fish and is suitable for tropical and coldwater fish. Frozen bloodworm is often used as a good supplement to the regular dry feed used on a daily basis. Many fish breeders use bloodworm as a component of growing young fish on and conditioning. 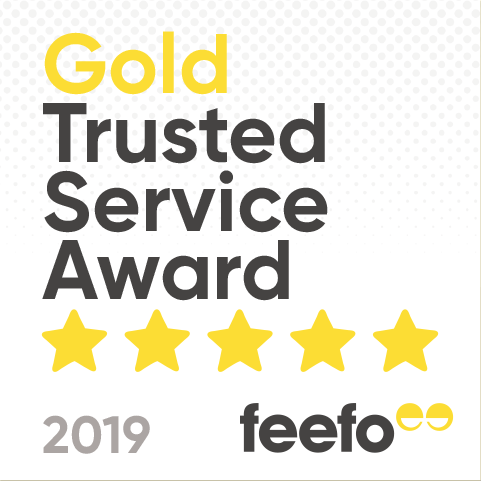 For more information, speak to your local store team.